All about food, cooking, people, and positivity. EP 16//::: David Dolginow: Shacksbury Cider Co-Founder. David Dolginow is the co founder/ owner of Shacksbury Cider based in VERGENNES, Vermont. He has help build Shacksbury with his co founder Colin Davis to be a forward thinking modern company with a stone ethos of collaboration partnering with all sorts of other producers, artists and farmers…and they have forged a new partnership with Krista Scruggs ZAFA wines opening Co Cellars in Burlington, Past and current collaborations include:::: Vermont natural wine maker, author and Diedre Heekin from La Garagista Other Cider producers: Petritegi Sagardoa in the Basque country Spain and Dragon Orchards in Herefordshire, England Vermont farmers: yoder farm, and Michael lee from Twig farm: restaurants: Momofuku Beer brewers like modern times brewing: and artists like Will Bryant They forage for apples and have propagated some of these lost varieties at Sunrise Orchards They create unique ciders with character and voice. David is from Kansas City and he has something to tell New Englanders about Barbecue but you have to listen until the end. From Shaksbury’s Website:: “The apples of America's early cider tradition, lost for a variety of reasons, are not hard to find in Vermont - once you know what you're looking for. Though far less numerous than they once were, the trees materialize around every bend, and over every hill, hiding in plain sight. To us, these trees represent a door to another time, and the basis for superior cider. In the fall of 2013, and each subsequent harvest, we set to find some of these trees. We have sampled thousands of apples, fermented cider from over 150 unique trees, and selected twelve varieties to propagate. We have grafted these twelve varieties to over 1,000 trees, marking the beginning of our "Lost Apple Orchard" at Colin's farm and with our partners, Sunrise Orchards and Windfall Orchard. Each year we continue to harvest, graft, and plant trees in an effort to expand our source of Lost Apples.” SIGN UP FOR THIER CIDER CLUB:: https://www.shacksbury.com/cider-club/ MORE INFO AND SIGN UP FOR THIER NEWS LETTER:: https://www.shacksbury.com Follow Shacksbury:: Insta: https://www.instagram.com/shacksbury/ Follow Cooking Up A Podcast:: Instagram: https://www.instagram.com/cookingupapodcast/ Facebook: https://www.facebook.com/CookingUpAPODCAST/ Follow Nevin: instagram: https://www.instagram.com/nevintaylor/ facebook: https://www.facebook.com/NevinTaylorCooks/ NEVINTAYLORCOOKS.COM for recipes, videos and more! Anne is a four time women’s national spearfishing champion. There are meets that happen a few times a year where you go out the fish that you catch count as points. The meets are timed and the more fish you get, and the bigger fish, the more points you get. So she is good at spearfishing. I went to Anne’s house in Watertown on marathon Monday to interview her for Cooking Up A Podcast. Her house is is small simple place right near the Charles river. She has a small yard with all the extra space filled with raised beds and chicken wired patches of freshly tilled earth for her gardens. There is a boat covered with a tarp in the driveway. She said she didn’t even take it out last year. The kayak is much easier to get on and off of to go diving. EP//006: Organic greens, herbs, and life: EVA SOMMARIPA. 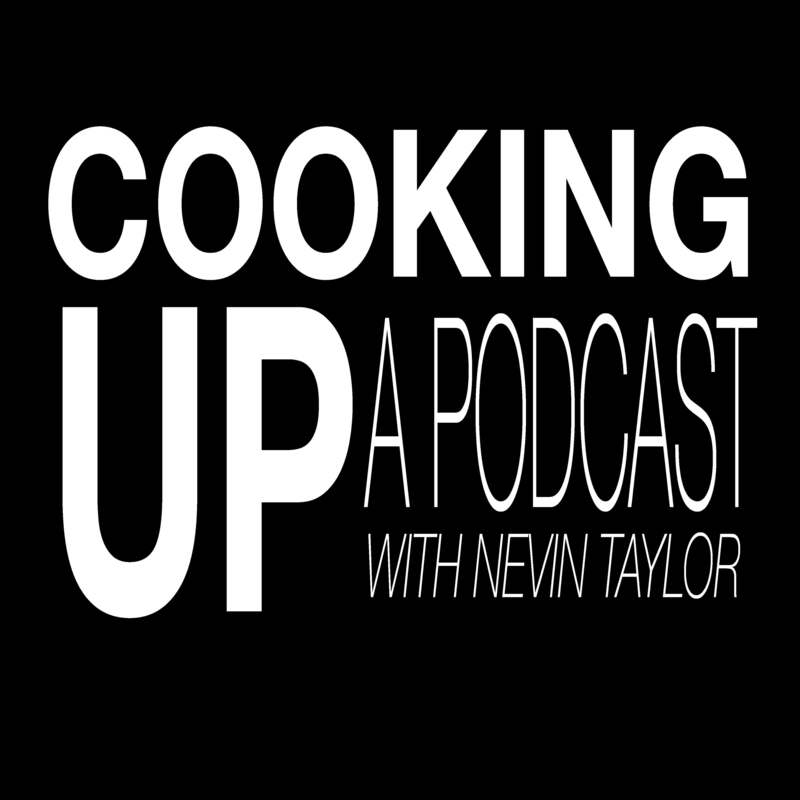 My guest on Cooking Up A Podcast this week is Matt Linehan from Sparrow Arc Farm in Copake, NY. Matt is farming just about 200 acres just past the Berkshires. He started farming in Unity, ME on just an acre hustling down the 5 hour drive to Boston selling mostly arugula in 2006. He knocked on restaurants doors with his products and built it all up to where he is today. Growing vegetables and running a farm is Matt. The vegetables he grows are an expression, they have some of his character and energy in them. He is the real deal, follow him on Instagram: @sparrowarcfarm you can see videos and pictures of his potato harvester and tractors and pictures of beautiful potato fields. EP//003 BEEKEEPING, URBAN AGRICULTURE WITH BILL PERKINS. EP//001 THE MUSHROOM KINGDOM WITH GUEST TYLER AKABANE. This week is all about the magical mushroom kingdom. I interview Tyler Akabane, he is a mushroom extrodinaire. He forages, leads educational foraging walks with a dinner hosted by a local chef, sells mushrooms to Boston restaurants, and is a good friend and and all around rad dude. We talk about how he cooks mushrooms at home, what he has going on with his walks, and i'm making a new GREEN BEAN CASSEROLE recipe this week! check tyler out on instagram @mushroomsformyfriends Visit his website: mushroomsformyfriends.com and sign up for a walk this season!